This programme is designed to include youth into joint creation of changes in Kaunas and its district. The group of Kaunas Challenge participants (15 to 18 years) is selected every September and the programme takes place from October to March. 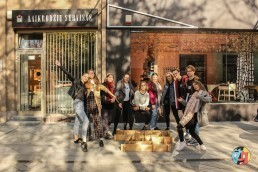 The programme includes the analysis and creative solutions to real challenges existing in Kaunas city and its district, carrying out practical tasks, developing projects initiated by the youth and learning how to work in a team. It is an opportunity for young people to realise their ideas for the city together with the team of Kaunas 2022. Young people who participate in the programme can continue their activities in the alumni club, where they are empowered to learn from the existing experience and experiment implementing their own ideas. The long-term vision of the alumni club is to enable young people to create and implement one of the major events of 2022. Kaunas Challenge programme carries out its activities in the TEMPO space in the Old Town of Kaunas, M. Daukšos g. 34. Stop by to become acquainted and share your ideas for the city.